Five hundred Oregon silverspot butterfly caterpillars have a new home on Saddle Mountain, courtesy of a species recovery program and a group of intrepid hikers. A volunteer team from Oregon State Parks, U.S. Fish and Wildlife, Oregon Zoo and Woodpark Zoo in Seattle was on Saddle Mountain’s slopes last week, gingerly placing the hungry caterpillars on the local wildflowers. 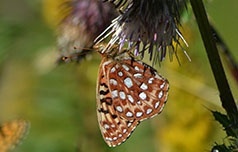 The Oregon silverspot butterfly (Speyeria zerene hippolyta) was federally listed as threatened in 1980, and population numbers have declined continuously over the last three decades. Today, just four isolated populations remain: three in Oregon and one in California. Luckily, Saddle Mountain is prime real estate for the threatened insects. It was chosen as the reintroduction site because a rare flower—the early blue violet—blooms in abundance there. 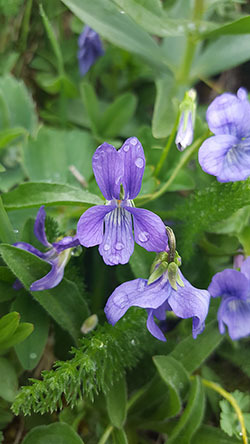 Early blue violets are the main food source for the caterpillars as they mature into adult butterflies. The mountain is one of the few remaining areas where early blue violets grow in large enough quantities to sustain a butterfly population. Elsewhere, the delicate violets have been choked out by invasive weeds and forest succession. The caterpillars began their journey to the mountain as part of the imperiled species programs at Oregon Zoo and Woodland Park Zoo. Each year, a small number of female Oregon silverspots are collected from wild populations and brought to zoo conservation labs to lay eggs. The hatched larvae are raised over the winter and released into the wild when they’ve matured into caterpillars. By all accounts, the caterpillars are happy in their new home. Project managers hope that this reintroduction will be the start of a vibrant and lasting Oregon silverspot butterfly population on the mountain.